Alberni Valley Blazers win girls’ softball silver in double knockout rematch with Stealers at the U19C girls' BC Softball Championships. 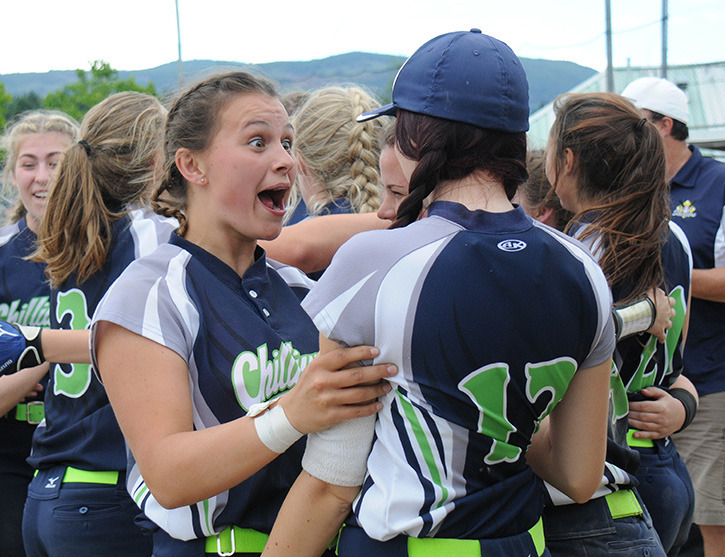 A bad call by Chilliwack Stealers’ third base coach at the end of the third inning that resulted in an out at homeplate was the rally call the Stealers needed to win the U19C girls’ BC softball championship, Sunday in Port Alberni. Stealers’ third-base coach Tony Rahnborn admitted he made a bad call and congratulated the girls after they scored seven straight runs to beat the host Alberni Valley Blazers 9-2 in the gold medal final. Chilliwack beat Mission, Sooke and the Alberni Valley in the eight-team double knockout round to enter the gold medal game from the winners’ side. The Blazers played four games on Sunday, losing a close 2–1 game to the Stealers to drop to the consolation round, then beating View Royal 7–0 to face Chilliwack in the final. View Royal won bronze medals. These two teams met each other two years ago at the U16C provincial championships, also in Port Alberni. That year Chilliwack won bronze, Alberni Valley won silver and Maple Ridge won the gold medals. Last year the Blazers won the provincial title, making them defending champions. The Blazers also had a core team through many of those championships, Charlesworth said. Charlesworth said community support throughout the weekend was a motivator for the Blazers.